April 3rd has been marked as National Boysenberry Day, by none other than Knott’s Berry Farm. It also just so happens to coincide with the Boysenberry Festival happening right now until April 23rd. Do you think this was planned? Who cares. I want any reason to eat stuff with Boysenberry! 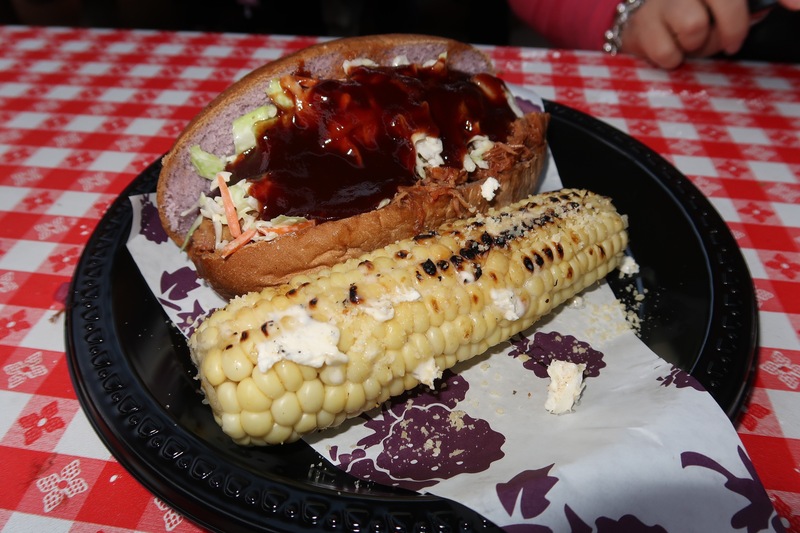 After checking out the Knott’s website to see what kind of yumminess I could have for dinner, I picked something new that was not on the Boysenberry Festival Tasting Card. For those who don’t know, there is a tasting card and for $25.00 that allows you get 6 different Boysenberry Foods, such as pizza, ravioli and meatballs. I decided to try the Boysenberry & Apricot Pulled Pork sandwich, which was also on a Boysenberry infused roll and it did not disappoint. The sandwich was topped with coleslaw and Boysenberry BBQ sauce. The corn on the cob was delicious and of course I could not pass up the Boysenberry Punch. Way too much for me to finish, but boy was it good. With a full belly, it was time to walk around the park for a bit. Another popular Boysenberry item is the Boysenberry Beer & Wine. There is also a $25.00 tasting card for 6 tastes of the beer and wine. Since the park was only open until 8pm, they were no longer serving. An employee shared with us last call is 6:30pm. I am sure this area is open later to match the park hours on the weekends. Next, a Boysenberry taffy stop on the way out of the park… I told you I liked Boysenberry. This is a great little treat while sitting on the couch after work. It has to be fresh or forget it. It was super fresh, so ring me up! One more stop. This time to give big hugs to our friend Colleen Tolley. She was there with her son, who was having fun on Log Ride, so time for a quick chat. It is always great to see friends, laugh and of course take a picture. Just a quick visit to Knott’s for some tasty food, but we will be back soon to experience all that is Boysenberry. The last day is April 23rd and as fast as the days are flying past us it will be here before you know it. So don’t miss out on the Boysenberry Festival! Beauty and the Beast 2017.